In many years of traveling to Mexico I've often encountered a tall, elegantly attired female skeleton sporting an extravagantly plumed hat — in books, in cartoons, on posters, in figures and in the works of some of Mexico's greatest artists. I gradually realized that she is not just one among the proliferation of skulls and skeletons in Mexican art and lore, but a distinct figure named La Catrina. It took San Francisco's Mexican Museum to drive home just how beloved and deeply rooted in the Mexican psyche La Catrina is. For its Oct. 29 fundraiser launching a final push to complete its new and greatly expanded home in the Yerba Buena Arts Center, the museum is holding a La Catrina party. "La Catrina: Keeping the Spirits Alive" will invoke all the traditional Day of the Dead elements, re-creating a Mexican village whose paths are lined with marigold-strewn altars created by local artists to remember loved ones who have died. Mariachi and salsa tunes will fill the air, with the promise of a spin around the dance floor with the flirtatious, fabulously dressed skeleton. La Catrina as we know her originated with Jose Guadalupe Posada, considered the father of Mexican printmaking. Born in 1852, he apprenticed to a local printmaker and publisher when he was just 14. Moving to Mexico City in 1888, he soon became the chief artist for Antonio Vanegas Arroyo, publisher of illustrated broadsides, street gazettes, chapbooks and other popular forms of literature, including songbooks for the popular corridos. He became famous for calaveras (skulls or skeletons) images that he wielded as political and social satire, poking fun at every imaginable human folly. His influence on Diego Rivera, Jose Clemente Orozco and other great artists of their generation was incalculable. Posada's illustrations brought the stories of the day to the illiterate majority of impoverished Mexicans, both expressing and spreading the prevailing disdain for Porfirio's regime. The image now called "La Calavera Catrina" was published as a broadside in 1910, just as the revolution was picking up steam. Posada's calaveras — La Catrina above all, caricaturizing a high-society lady as a skeleton wearing only a fancy French-style hat — became a sort of satirical obituary for the privileged class. But his Catrina cast a wider net: His original name for her, "La Calavera Garbancera," used a term that in his day referred to native Mexicans who scorned their culture and tried to pass as European. 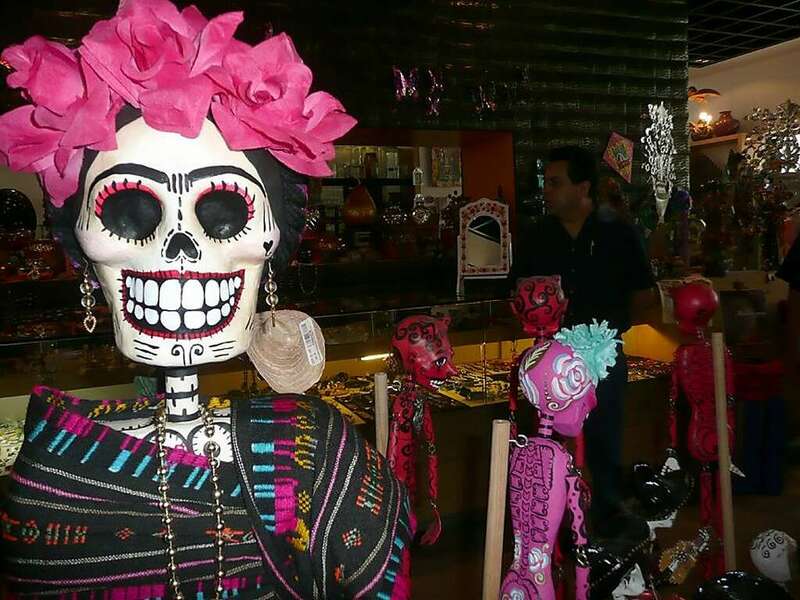 "La Catrina has been iterated over time," de la Torre said. "It's not just Posada and his work in 1910. There are layers of history. The image and the woman in death goes back to the ancient Aztec period. Posada took his inspiration from Mictecacihuatl, goddess of death and Lady of Mictlan, the underworld." Also known as Lady of the Dead, Mictecacihuatl was keeper of the bones in the underworld, and she presided over the ancient monthlong Aztec festivals honoring the dead. With Christian beliefs superimposed on the ancient rituals, those celebrations have evolved into today's Day of the Dead. Posada's image was basically a head shot, unclothed except for the elegant hat. It took Diego Rivera to portray a full-length figure, put her in an elegant dresss and, by some accounts, to dub her "La Catrina." 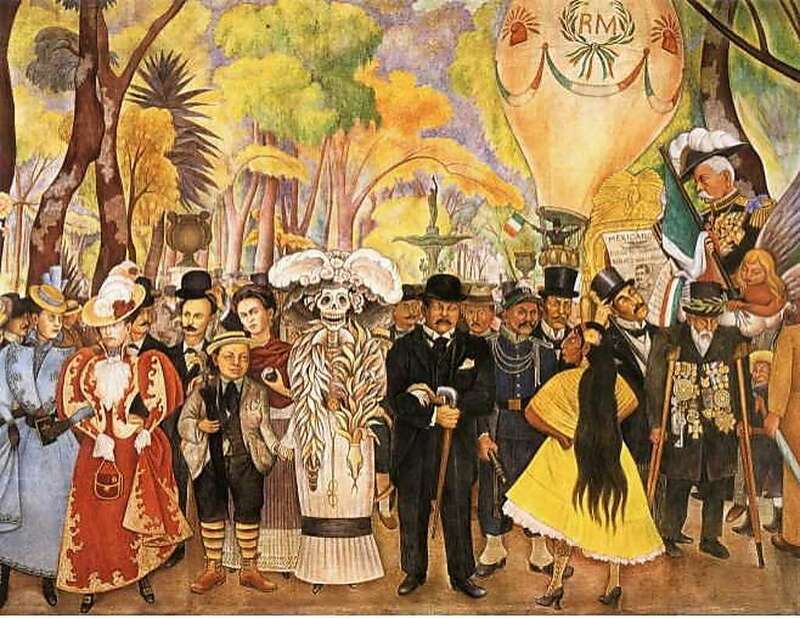 In the center of his 50-foot mural, Sueño de una tarde dominical en la AlamedaCentral ("Dream of a Sunday Afternoon in Alameda Park"), Catrina holds the 10-year-old Rivera's hand while Frida Kahlo in traditional Mexican dress stands behind them. None other than a dapper Posada himself stands to Catrina's left, offering her his arm. The symbolism — and this is but a fraction — is staggering. La Catrina's vacuously grinning skull fell inevitably into the role of literal and metaphorical poster child for the Day of the Dead, symbolizing the joy of life in the face of its inevitable end. But La Catrina is the beloved grand dame of Mexico's dance with death 365 days a year, appearing in at least two movies, graduating from drawings to sculpture, and taking on such roles as mermaids, brides and the all-around icon of the recent Bicentennial celebrations. A product of the irrevent spirit and rebellious fervor that ignited a revolution, lovingly kept alive and evolving over time, she remains as relevant today as she was a century ago. She is all the more endearing for reminding us of one more Mexican characteristic that sits 180 degrees from today's U.S. population: The ability to extract humor from protest, to poke fun at the powers that be and at sacred cows of any description with no concern that someone might take offense. As de la Torre observed, "It's about class and society, and we can draw relevance in today's world about that, too. There are some very real similarities."